The New York Police Department (NYPD) discovered the limitations of current drone technology on New Year’s Eve when rain forced it to cancel plans to use the machine as part of its security operation during the celebrations in Times Square. 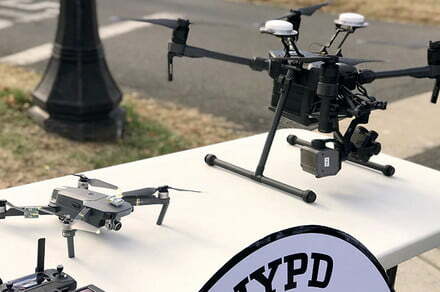 NYPD Chief Terence Monahan confirmed in a tweet that the police department’s quadcopters wouldn’t be taking to the skies because of the lousy weather that had descended on the city. The plan had been to use the camera-equipped drones to monitor the huge crowds celebrating the arrival of the new year in Times Square, but the inclement weather posed a risk to the drones’ stability, and the last thing the NYPD wanted was to have one of its flying machines falling from the sky and possibly onto someone’s head. It would have been the first time for the NYPD to deploy its drones for security purposes at a large-scale event. The NYPD’s drone equipment is comprised of 11 DJI Mavic Pro quadcopters, 2 DJI Matrice 210 RTK quadcopters, and 1 DJI Inspire 1 quadcopter, but all of the remotely controlled drones were grounded during Monday night’s celebrations. When the NYPD first announced its plan to use drones as part of its New Year’s Eve security operation, Deputy Commissioner of Intelligence and Counterterrorism John Miller said the machines would offer “visual aid and flexibility” with their ability to travel at speed over a large crowd to any spot deemed a location of interest, while at the same time providing support for 1,225 portable and stationary cameras. But now the police department will have to wait another day to deploy its drones at a major event. The decision to ground the drones for fear of the machines malfunctioning in rain and strong winds reveals the technology’s current limitations when it comes to using them for security at events involving large crowds. The NYPD announced in December 2018 that it would begin using drones for some of its work, which besides event security could also include search-and-rescue operations, crime scene investigations where the location is hard to access, hostage situations, and incidents where hazardous materials are present. The equipment is operated by licensed police officers of the Technical Assistance Response Unit (TARU), each of whom has received extensive training, the NYPD said.